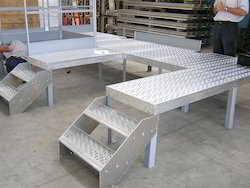 Our range of Steel Mesh Platforms is widely used as filters and screens in oil, chemical, pharmaceutical and food industries. These are available in various patterns like plain weave, twill weave, Dutch weave and huddle twilled weave. Material Mild Steel chequered plates for Floor. Sections and Construction designs are available on requests. Strong and tested welding by best experienced Welders and Fabricators. Steel platform with a single support pillar family support, with primary and secondary beams floor support, the warehouse is divided into upper and lower2 ~3space in a unique shelf.Separated from the space can be used for storage or office. Steel platform with a single support pillar family support, with primary and secondary beams floor support, the warehouse is. divided into upper and lower2 ~3 space in a unique shelf. With a firm commitment to quality, our organization is engaged in manufacturing a wide ambit of highly durable Steel Suspended Platform. We designs the Steel Stagings & platforms as per required loadings. In order to cater the increasing demands of our honored patrons, we are dedicatedly occupied in offering a wide array of Steel Structural Platform. 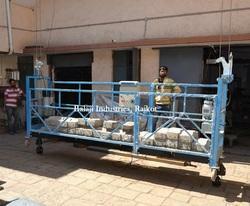 The provided range is delivered by us at clients’ end within the predetermined time frame. With an impressive growth record in this industry, we are manufacturing a wide array of Steel Platforms.